I have had so much fun creating things for my Valentine’s Day mantel this year! A few fun little projects all coming together to make quite the festive little display. If you like you can see my previous Valentine’s Day mantels here, here and here. It’s such an awesome holiday to decorate for… so many options and ways to go to show your family you love them! The biggest project for my mantel this year was the cute XOs I created out of wood. I had been thinking about how to do these for quite a while and was so happy with how they turned out! You’ll need: wood round (found at Home Depot in lumber section for about $5), two 1x4s cut to about 18″ in length, dark wood stain (I used Ebony), craft paint (whatever colors you’d like), vaseline, painter’s tape, round sponge brush, sandpaper. STEP ONE: Stain wood and allow to dry completely. This makes that fun dark color show through when you distress it later. STEP TWO: Apply vaseline in places that you want the paint to chip off easily. STEP THREE: Paint wood entirely with solid color (I used white). Allow to dry completely. Then tape off stripes if desired and paint with accent color. STEP FOUR: Remove painter’s tape. Paint heart on wood round, if desired. STEP FIVE: If you want to add polka dots, dip round sponge brush in paint and dob board to create dots. Allow all to dry completely. STEP SIX: Using fingernail, scrape paint off where you applied the vaseline. You can see the spots if you hold the board in the light. The vaseline areas are a different texture than the rest of the board. Remove as much or as little as you want! I then took some sandpaper and sanded the edges as well. STEP SEVEN: (not pictured) Stack 1x4s and using a nail that is long enough to go through one board but not long enough to go through both boards, hammer nail into back of boards. Then “fan” them out to create your X. Adjust to how you like it and then you’re done! I also painted a picture frame I had around the same color red I had used on my XOs and hung it up with a picture of my kids in it. 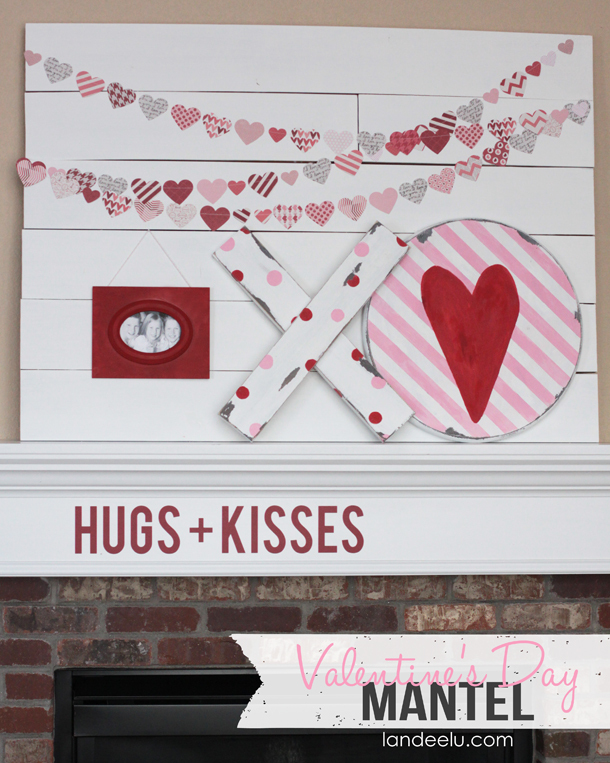 And then I added the “HUGS + KISSES” in red vinyl to the front of my mantel to complete the entire look! I need to use that wide white space more often. I love how it turned out! Thanks for stopping by and have fun creating some pinky, hearty, Valentines-y creations! I’m new to your blog but I’m obsessed!!! I love all your ideas! Thanks for sharing your talents! You may have already answered this in a previous post but how did you make your wood background that sits up on your mantel? I would love to do something similar but my thought/worry was that it would be really heavy. Any direction or advice would be greatly appreciated. I have now painted it all white and it’s the perfect backdrop to pretty much everything! It is quite heavy but I can get it up there with no help and it just leans against the wall. If you are worried about it I would secure it to the wall somehow as well. Thank you so much! Yes, I love that it is so long and it took such a small amount of time to make!